Apple's stock was down more than 8% in after-hours trading as the company reported roughly flat earnings for fiscal Q1. Two key data points from the report were -- 1) iPhone sales that missed analyst estimates by a wide margin and, 2) a forward guidance that implied a YoY revenue decline in fiscal Q2. Let's attempt to understand the disparity between analyst forecasts and the market realities facing Apple. These posts establish a conceptual framework that explains value chain evolution in the premium smartphone industry. This framework could help us understand the disparity between analyst forecasts and actual sales. Apple shipped 51 million iPhones in the quarter which is about 7% higher than the figure from last year. However, this isn't really an apples-to-apples comparison. During fiscal Q1, Apple added a distribution partnership with NTT DoCoMo (Japan's largest carrier) and included China in the initial iPhone roll-out. As a result, these two regions accounted for nearly all of Apple's revenue growth in the quarter. If we exclude the incremental contributions from these channels, iPhone sales clearly declined on a YoY basis. Apple revenue guidance for fiscal Q2 2014 was in the range of $42 to $44 billion, compared to $43.6 billion in revenue in fiscal Q2 2013. This was driven by two major factors -- 1) moving China's iPhone launch from fiscal Q1 to fiscal Q2 and, 2) lower than expected initial sales at China Mobile. Analyst forecasts, and hence market expectations, of both data points were considerably higher. But why? How did analyst forecasts fail to account for weak demand signals from public data sources like Kantar and Google Trends? The forecasting methods used by traditional analysts tend to be quite reliable when the primary product performance measure used by customers (i.e., the "basis of competition") is well understood. The same forecasting methods fail when this basis of competition changes. This is because these methods do not account for changing customer requirements, i.e. they fail to understand when a product category has become "good enough" for mainstream consumers, causing them to value other attributes instead. Consequently, analysts pay much more attention to high-end (most valuable) consumers than they do to low-end (least valuable) consumers, even though disruptions always take hold among non-consumers or the least valuable consumer segments of an incumbent. In the premium smartphone market, the basis of competition among "lower-end" consumers has shifted to pricing and customization to individual preferences (e.g. : screen size). This, combined with carrier moves towards transparent pricing (driven by a basis of competition shift in the US telecom industry), increased competition to "unexpected" levels. Therefore, even as the sales performance of the flagship iPhone 5S remained strong, Apple was losing potential buyers of its "cheaper" iPhones to "good enough" competitors. 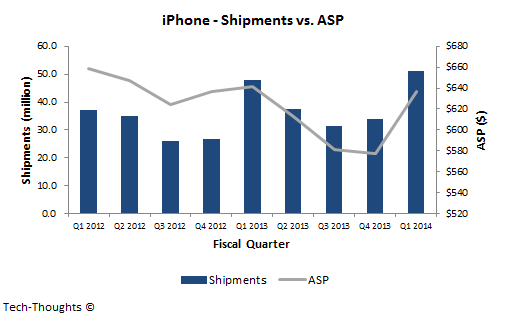 The combination of the iPhone's weak volumes and sudden spike in ASP confirm this fact. At this point, we may well have reached "peak iPhone" (or "peak Galaxy" for that matter). Going forward, Apple will need a disruptive new product category to regain investor confidence. But within the smartphone industry, I expect the balance of power to shift towards companies that use hardware as a distribution channel to monetize services.